A pair of RCA Records gems from Hugo Montenegro – back to back on a single CD! 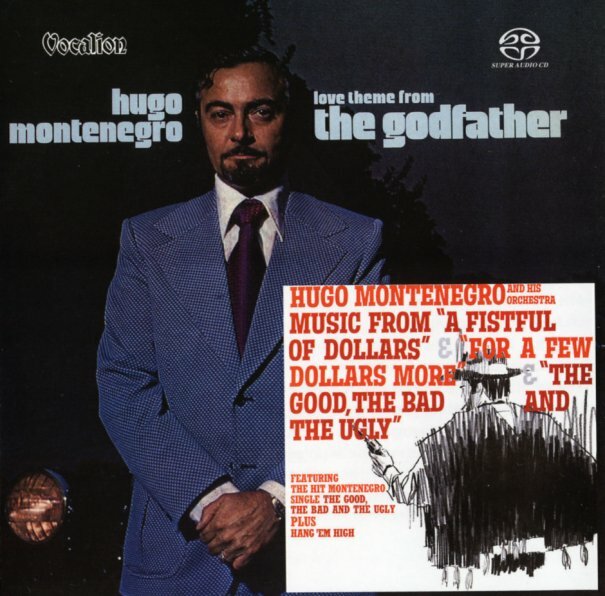 First up is Theme From The Godfather – a sweet 70s update of the moogy groovy that Hugo Montenegro first started crafting in the 60s! The album's got both moog and Arp – the latter of which brings in more of a 70s electric vibe – and there's also some very cool sound effects on the record too, which really ups the ante for the sort of groove that Montenegro was creating! Tunes are all pretty well chosen – making for a super-dope batch of numbers that really gets past the usual – and the set includes an excellent reading of "Me & My Arrow", from Nilson's The Point; 2 versions of Nino Rota tracks from The Godfather; a nice version of Faure's "Pavane", with lots of spirally keyboards; a medley of "Baby Elephant Walk" and "Moon River"; and even a few nice originals, like "Quadimodo" and "Stutterology". On 1968's Music From A Fistful Of Dollars, Hugh Montenegro makes his way through a number of late 60s Morricone spaghetti western themes, all done with his groovier than usual twist on the material! The Montenegro touches here include some augmented rhythms – snapping the tunes along with a much modder feel at times than the original – plus a nice use of electric bass at the bottom, and some sunshine-drenched vocal passages have some great harmonies! Titles include "The Vice Of Killing", "For A Few Dollars More", "Story Of A Soldier", "The Good, The Bad, & The Ugly", "The Ecstasy Of Gold", "Sixty Seconds To What? ", and "March With Hope". © 1996-2019, Dusty Groove, Inc.